The Dark Ranger: The Rangers Reclaim "The King"
Blueshirts Goalkeeper Henrik Lundqvist has signed a six-year contract extension of $6.875 million per season. No more speculation on free agency after this season, our very own Olympic gold-medal winner can no longer be distracted with contract matters. 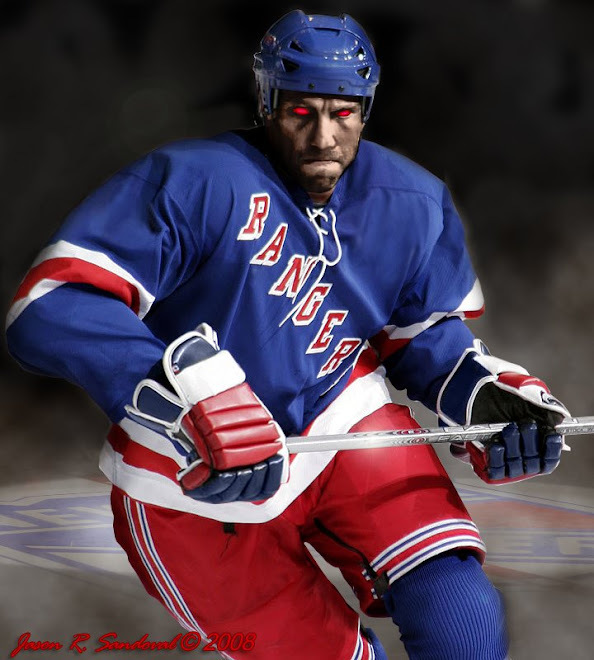 The Rangers just bought you and we all can now reclaim your old moniker "The King." Or at least, here's hoping. This is the story of Henrik Lundqvist, one of the top three performing goalies in the NHL at the beginning of the season, who by many was considered the top goalkeeper in the league with the best goals against average and save percentages for the first two months of the NHL. Sniffings of Vezina were in the air. The New York Rangers were kept alive by Lundqvist's efforts, even with a sub-par defense and a non-scoring All-Star offense, he virtually was the Rangers defense and confidence. He was reliable. In the midst of losing games, Henrik and his agents were attempting to negotiate a long-term contract with the Rangers - never forgetting that management dragged him through arbitration during the off-season and couldn't come to terms with a long-term contract due to the salary cap, fully aware that newcomer Scott Gomez was taking $8 million and Chris Drury taking $7 million per year. With some of the greatest goaltending seen in the league last fall, Henrik would have commanded more in salary than any player on the roster, but with his latest woes and stats - this accepted compromise of just under $7 million per season for six years represents the Rangers belief in him as a long-term interest, someone who will step it up after the distractions. Until proven otherwise, I will continue to start Henrik Lunqvist on my fantasy hockey team and, most importantly, The Dark Ranger will now refer to Lundqvist, once again, as THE KING. Prove me right, Henrik. I bought the jersey and you signed it. We, here at The Dark Ranger, were so honored to see that Hannah Montana paid us a visit and solicit our business. Dark squashed her. No menus please. i hope to God that he plays well on the rangers return. what a shame if he kept playing like this and we are stuck with him for another six years. He is a great goalie when he's on, but you are right- the last couple of months have been brutal. Long Live the King!